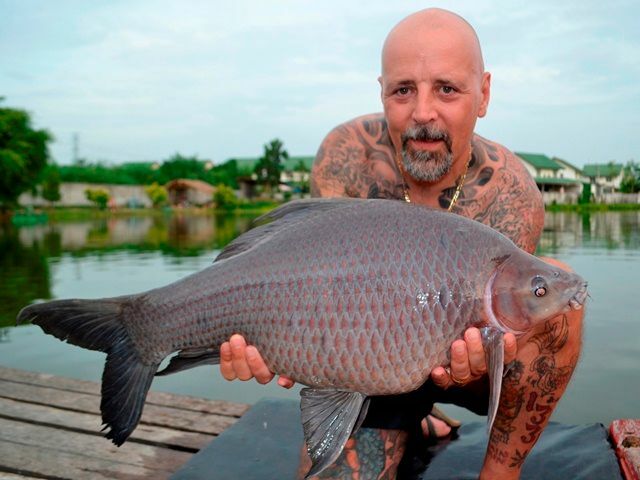 Return customer Micky Qualye was off to a flying start breaking the lake record for Chinese silver carp and Chinese bighead carp in successive days. He also caught a number of new species that included rare Chinese black carp and small scale mud carp as well as stingray, catla carp, mrigal, Siamese carp, an awesome vundu catfish, and finally caught one high on his wish list an alligator gar. 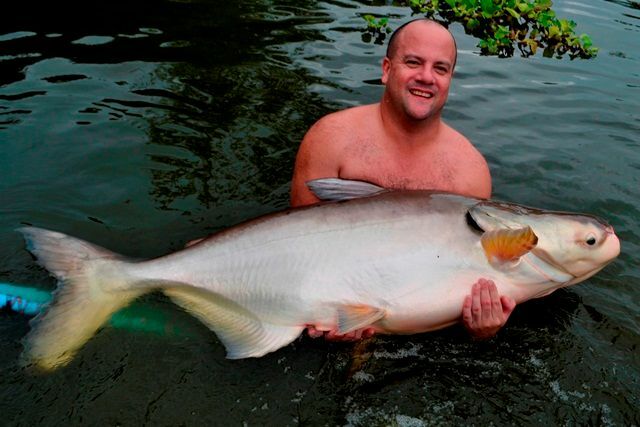 He also joined the Palm Tree 300lb catfish club with a huge Mekong catfish that took him just over two hours to land. In addition he caught pacu, tambaqui, rohu, Amazon redtail, Asian redtailed catfish, striped catfish and catfish shark. Tap brought up three American anglers for his first trip of the month. 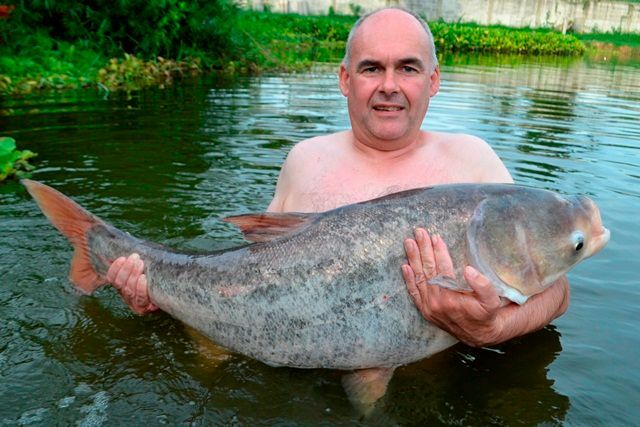 After catching a number of Amazon redtails they went onto to catch a 150lb+ club qualifying Siamese carp after a lengthy 100+ minute battle. They also caught a stunning yellow catfish and a stingray. Indonesian angler David Lumanauw caught a huge number of awesome fish including many new species during his session at Palm Tree Lagoon. 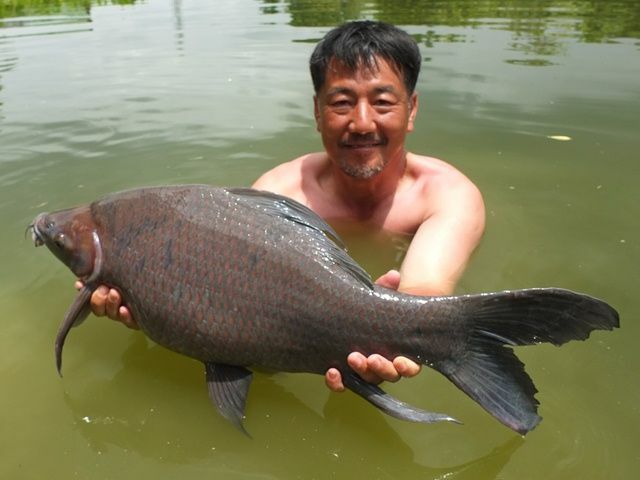 High on his target list was a Siamese carp which he got first fish within his first hour of fishing. 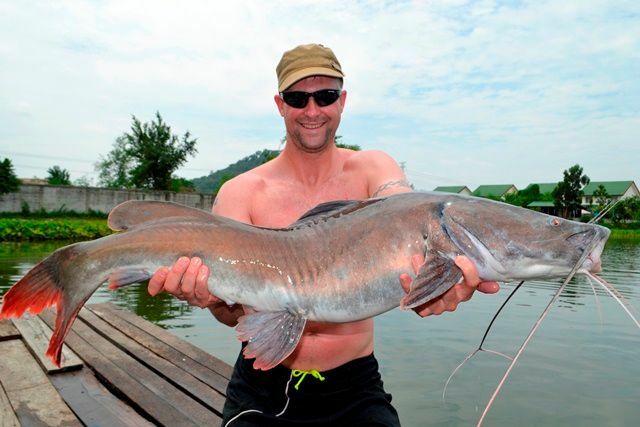 He then had an amazing double header of two ripsaw catfish and followed it up the next day with two rare Salween catfish caught only twenty minutes apart. 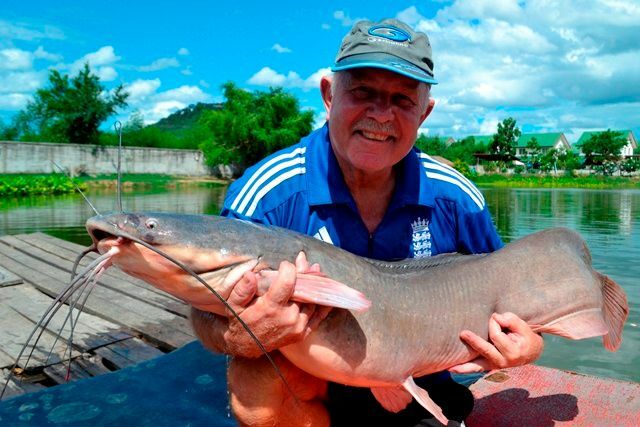 Also on his wish list was a 'dog eating catfish' or chao phraya which he also achieved catching five of them in an afternoon. He then followed that up with a stunning Atlantic tarpon. 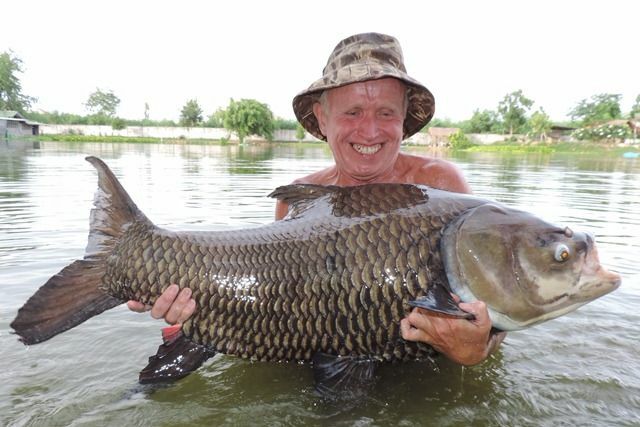 He also caught a number of other great catches that include catla carp, rohu, black shark minnow, Juliens golden price carp, alligator gar, striped catfish, catfish shark, Amazon redtailed catfish and finished off in style with a 116lb Siamese carp. 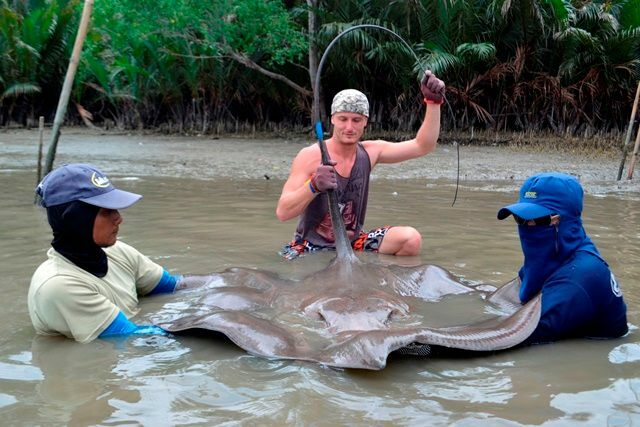 Andreas Karlsson and Thian Black also returned Andreas caught two new species namely a stingray and a soldier river barb as well as pb ripsaw catfish and tambaqui. 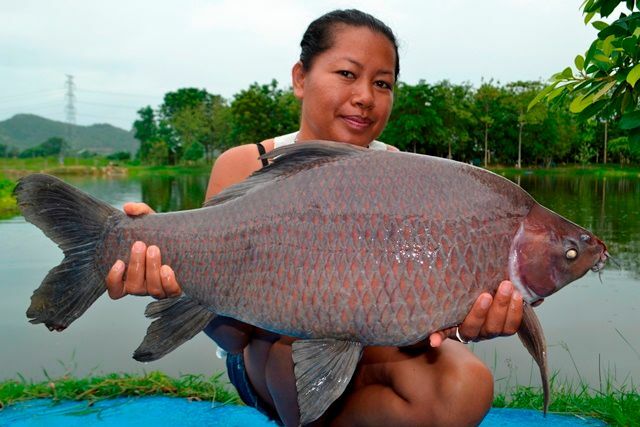 They also caught a number of good sized Siamese carp as well as an awesome giant gourami, wallago attu, rohu, chao phraya catfish, and a stunning Juliens golden price carp. 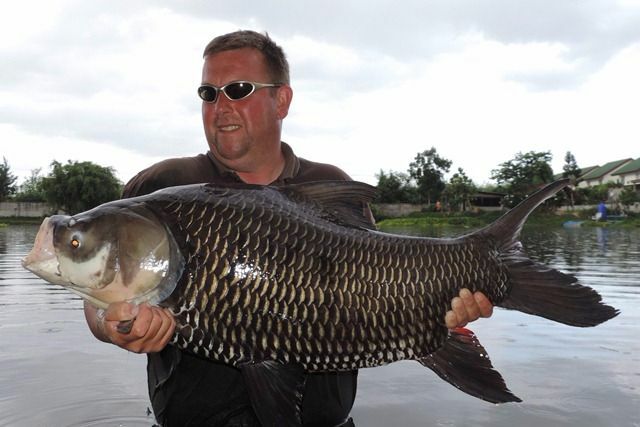 Andy Harman also managed to squeeze in an extra visit between jobs although no monsters this time did catch his first Chinese black carp which went over 20lb the biggest one caught from Palm Tree to date. 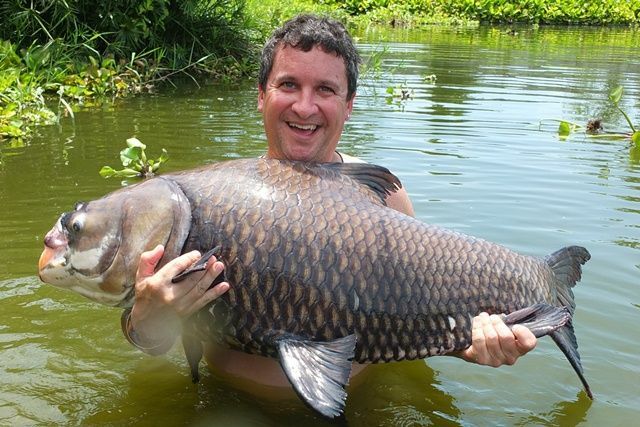 He also managed to land one Siamese carp over the 100lb mark as well as a number of other great catches that included tambaqui, leopard catfish, mekong catfish, a big alligator gar, Juliens golden price carp, rohu, wallago attu and a number of Asian and Amazon redtaills. Peter Mckeever and Tim went down to the Mae Klong river in pursuit of the giant freshwater stingray. Although no monsters were landed this time, they both caught with Peter easily breaking his previous pb. Brett Simmons manage to squeeze in an extra trip to Palm Tree and caught a number of good sized Siamese carp along with a new species for him a Chinese highfin catfish, a nice sized alligator gar, rohu as well as both Asian and Amazon redtails. Francois Pineau and Vun Sohka accompanied this time by her father were back for another session. They caught some stunning black shark minnows along with some huge Amazon redtails. 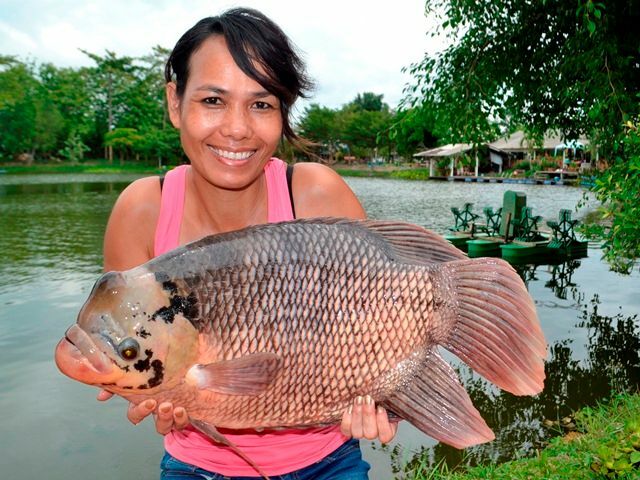 They also caught Siamese carp and Mekong catfish. Michael Pye was back and had several new species including a rarely caught golden belly barb, a Thai walking catfish and a stingray. 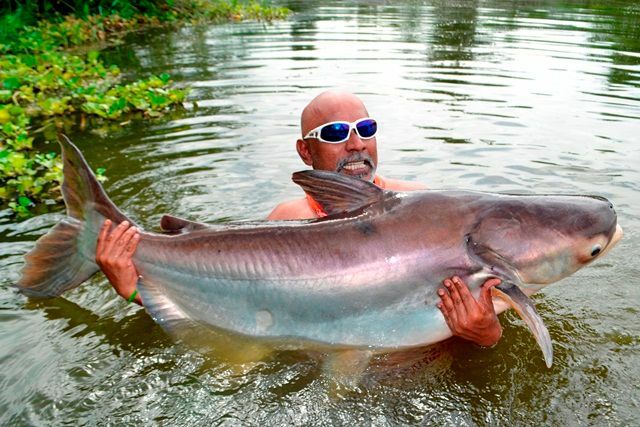 He also had a number of other awesome catches like ripsaw catfish, rohu, chao phraya, wallago attu, leopard catfish, and a number of both Amazon and Thai redtailed catfish. 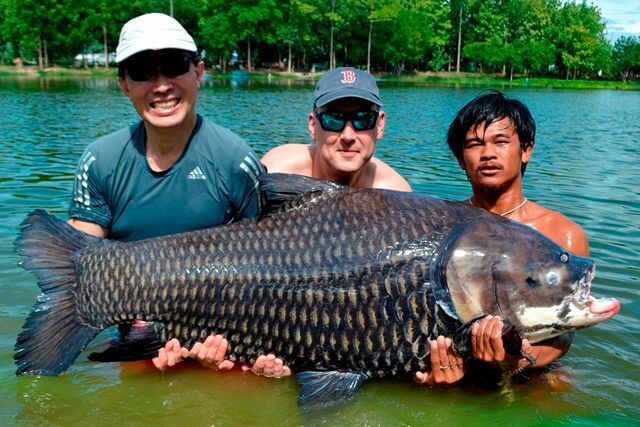 Magnus Hjelm and Jesper were back after a couple of years since they caught three arapaima in the same day this time they were targeting Siamese carp. 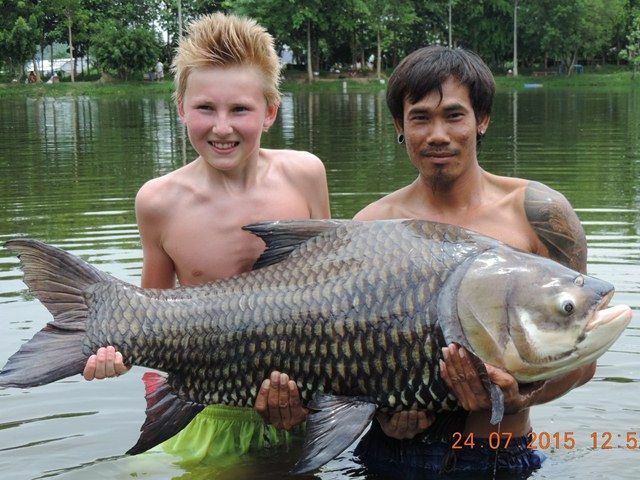 They successfully managed to catch some nice Siamese carp with Jesper showing his dad the way, along with mekong catfish, mrigal, tambaqui and Amazon redtails. Nick Peat was back only three days after his last session this time with a couple of fishing mates from Bangkok Rick and Derek. Nick was off to a good start with a new species for him a small scale mud carp, and Rick also had two new species a ripsaw catfish and a giraffe catfish, with Derek catching some big rohu and black shark minnow. They also caught a number of Asian and Amazon redtailed catfish. Peter Mckeever returned during the month with his cousin Wayne Blundelll. 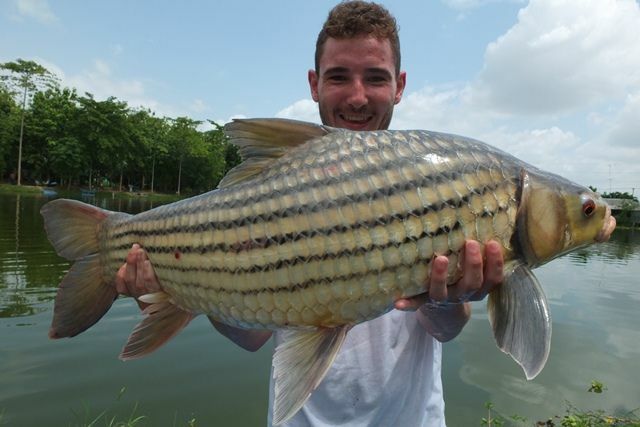 Between them they secured a number of great catches that included Juliens golden price carp, albino chao phraya, rohu, ripsaw catfish, striped catfish, alligator gar as well as both Asian and Amazon redtailed catfish. Barry Gregory and Ian Watson made a brief visit for their first time at Palm Tree. There was definitely an African theme to their catches, catching both a giraffe catfish and a vundu catfish two species that neither of them had even heard of before. They also caught Juliens golden price carp, rohu and another new species for Barry a soldier river barb. 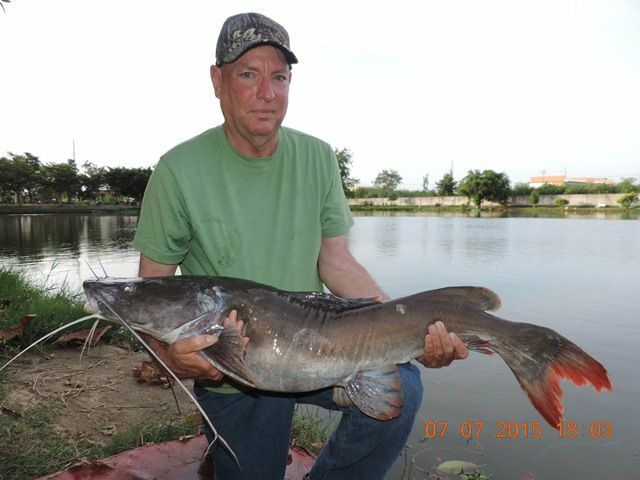 Phil Pratt and Vicki Brides were back fro there annual visit to Palm Tree and had several new species that included Asian redtailed catfish, rohu, big-Y catfish, chao phraya catfish, mollycot and yellow catfish. 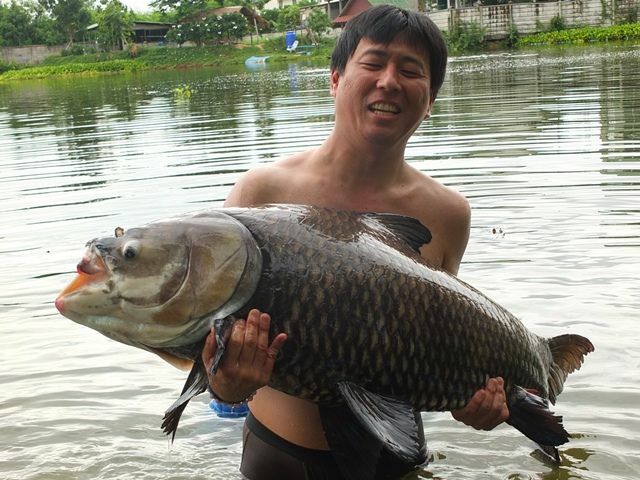 He also braved a torrential downpour to catch one of his Siamese carp, and also caught Amazon redtails, wallago attu, tambaqui, Mekong catfish, striped catfish and catfish shark. Nick Peat all returned for this month for a session catching a number of nice fish that included Siamese carp, rohu, tambaqui, Mekong catfish, Amazon redtails and striped catfish. Richard Clarke was back during the month and although didn't manage to catch any new species this time around did better three of his pb's namely black shark minnow, tambaqui and mrigal as well as catching some chao phraya catfish. Tap was back with return customer Cristofre a Canadian who now resides in Grenada. 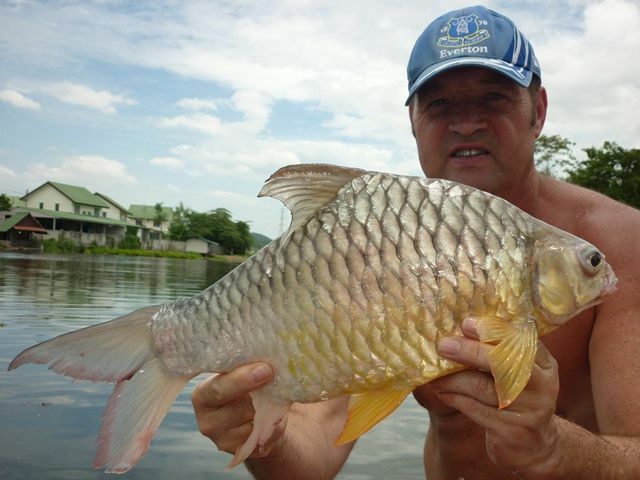 No club t-shirts to add to his Chao Phraya and Arapaima ones this time, but he did catch a new species an albino chao phraya catfish as well as a pb Siamese carp and both Asian and Amazon redtailed catfish. 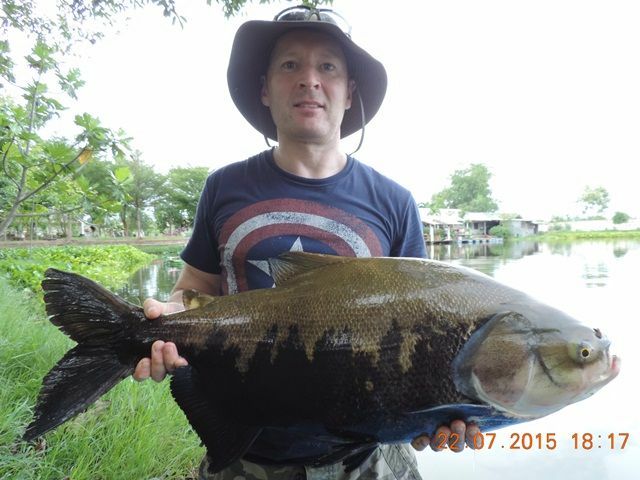 Stephen Squires made his first visit to Palm Tree during the month and caught a number of Amazon redtailed catfish, an awesome crystal eyed catfish, Siamese carp and a good sized Mekong catfish. Tap of Bangkok Fishing Guide Service came down with a group of five Malaysian anglers on a fishing safari tour of Thailand. 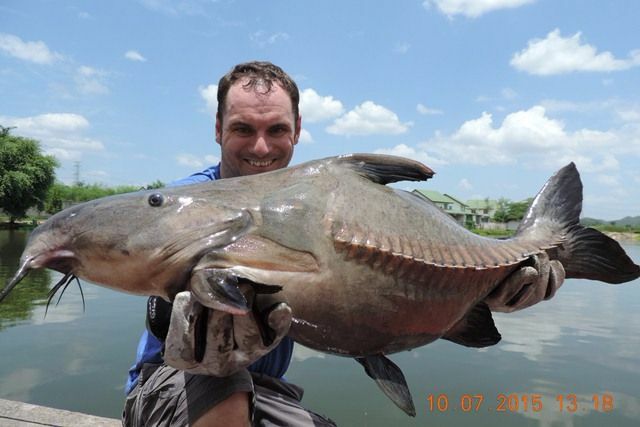 They caught a number of stunning fish topped by an albino chao phraya catfish, they also caught Mekong catfish, black ear catfish, tambaqui, chao phraya, catfish shark, leopard catfish, pacu and a large number of Amazon redtails. 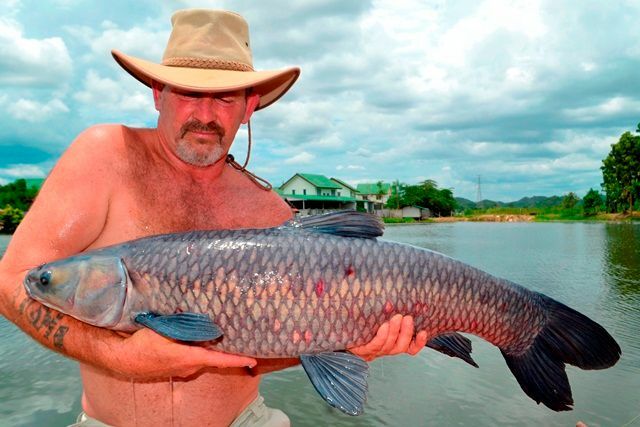 Bruce Walker also made his first fishing trip to Thailand from Vietnam, and was well happy with his catches of Mekong catfish, rohu, tambaqui and Amazon redtails. He vowed to be back soon with a few fishing mates. Tap's customer Revindran was so impressed with his first fishing trip to Thailand that when he got back to Singapore he booked another flight and was back a week later. 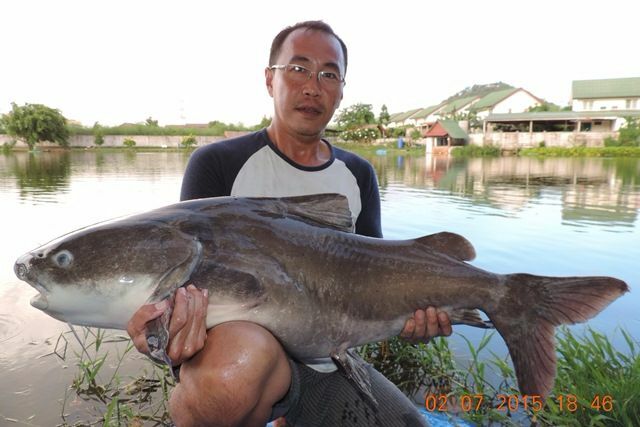 During his two visits he caught a large number of both Asian and Amazon redtailed caqtfsih as well as Mekong catfish, rohu, striped catfish and catfish shark. 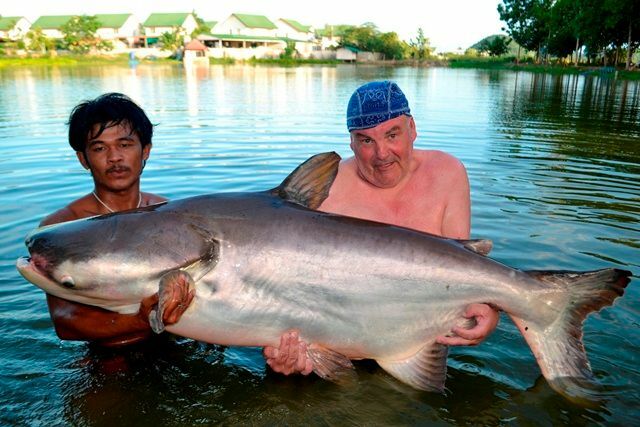 Fish Siam customer Steve was really after a big Siamese unfortunately they were not feeding during his visit but he did catch a number of other species like tambaqui, chao phraya catfish and both Thai and Amazon redtailed catfish. 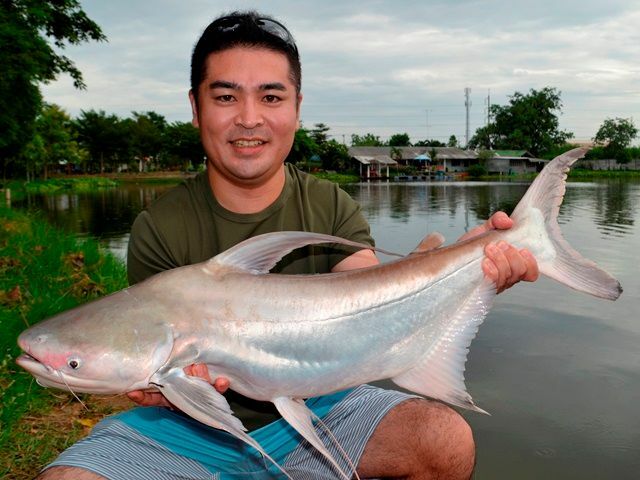 Tour guide Shigeharu Inouchi brought down a couple of Japanese anglers who caught several nice fish that included a good sized Siamese carp, Mekong catfish and tambaqui. Singapore John came down for a quick session and caught some nice black shark minnow and tambaqui. Tap of Bangkok Fishing Guide Service customer getting into the Palm Tree Asian and Amazon redtailed catfish.